In a world that uses the term “soulmate” so lightly, there sure aren’t many of them running around. If you are in search of finding yourself a match that is into the same things as you are, then Cowboy Soulmate was practically made for you. Take a look at our Cowboy Soulmate review to find out everything you want to know about this website. What we’ve come to appreciate when it comes to dating websites is simplicity and intuitiveness. Both of these virtues can be found in Cowboy Soulmate, and you can see that just from its homepage. Right from the beginning you have in front of you an easy-to-handle platform that is designed in shades of brown, white and gray, colors of the earth cowboys spend most of their lives on. You’ll also find a picture of an attractive cowboy couple smiling at you and the rest of the home page is dedicated to a simple registration process and member browsing. 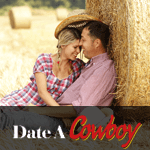 We did our fair share of reviews when it comes to best cowboy dating websites, and we can say with certainty that Cowboy Soulmate is one of the more promising ones in the niche. As we have already said in this Cowboy Soulmate review, this dating website runs on simplicity. Even before you become a member of the community, you can see new profiles snippets on the home page, which give you an impression of what you can expect in the community, but so much more can be found once you sign up. You register through filling out a simple form, and after you’ve entered your basic personal information, you get access to your profile, which is also very simple to use. It is easy to find your way around the profile. It really is a walk in the park and that is a good thing, because the sooner you add more information to it, the sooner you can start chatting up other cowboy singles online. The first thing we’d like to mention when it comes to this website’s features is that the registration is completely free, and when you pair that with the ease with which you can navigate the website, you can really find no excuse to at least try this platform out. When it comes to everything that Cowboy Soulmate has to offer in terms of features, it is quite standard for a good dating sites. First of all, uploading your photos is very important, because if you want to see someone whose profile you like, then you can be sure that they’ll like to see you as well. Update your good but realistic photos, people can’t really trust someone with an unclear picture, just put yourself in their shoes. Instant messaging is another classic, allowing you to chat up your potential sweetheart in real time, and there are forums that you can use to get to know even more interesting singles. If you are bold and wish to talk face to face, both audio and video chatrooms are available on the website. While writing our Cowboy Soulmate Review, we were pleased to find out that no significant problems occurred and the chatroom functions quite smoothly, which is a great plus. You also get access to your own little blackbook with personal favorite profiles and to the newsfeed, so you can keep track of all the interesting happenings in the community. The best thing we can say about the members of this growing website is the same thing that you can see on the home page of the site, written in caps lock – 100% real profiles certified! Naturally, if you’ve joined a community where you wish to find a compatible match that has a love for the cowboy life just like you do, you want to know that you are talking with actual people, and this is guaranteed on Cowboy Soulmate. The members may not be many, but more are joining every day, so just be patient and don’t be afraid to take a closer look at what you’re offered. Writing this Cowboy Soulmate Review has been a breeze, because the website is conveniently put together and works without a single glitch. If you’re living the cowboy life and want someone to share it with, then definitely take a look at the Cowboy Soulmate website. Boys on the site aren’t very active, though there’s a lot of them out there. I IM with some of them, and it’s fine, but nothing more then that. Not much soulmating for me so far, and I’ve been a member for some time now. Maybe it’s because I got free membership, but I don’t want to pay to be matched with someone. This website is easy enough, but the men on it obviously aren’t. Many interesting cowboys ladies out there, I didn’t expect that. I am very shy and don’t expect that people will understand my way of life, so this was a great place for me to start. The ladies were nice so far, and there is always plenty of people to chat with. Not much is happening here, I didn’t have much luck, but I like the website. If nothing, you can look through the profiles of pretty ladies, so I’ve got that going for me.